I’m not going to lie: the cover art really drew me in with this one and the synopsis sounded incredible: an explosion on a train, a sole survivor who can’t remember the day of the bombing and is now, one-year later, still searching for answers? The suspense was killing me before I even listened to the audio sample. When I saw (and subsequently heard) the narrators, I knew there was no going back--I love duel narrations and I’ve heard incredible things about Joe Hempel. 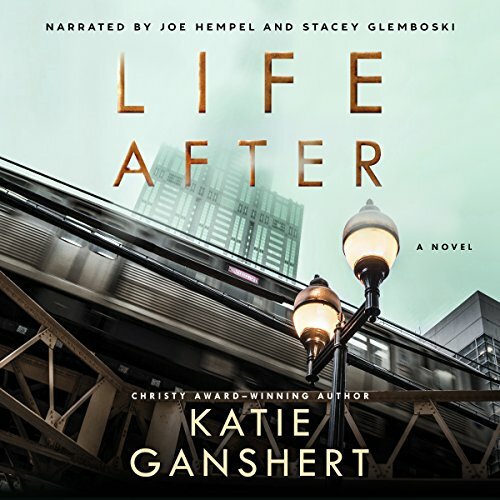 Life After: A Novel is an incredible book that tells a story of resilience and explores themes of grief, survivors’ guilt, and healing as the main character, Autumn Manning, struggles to move on following an explosion on a commuter train that left twenty-two others dead. As the sole survivor, Autumn is riddled with guilt and questions and cannot rest until she finds answers--and I don’t mean that as hyperbole. Autumn finds herself pacing graveyards at night as she battles insomnia and wonders why she lived while others perished. She has difficulty returning to work and faces an enormous desire to identify some purpose or meaning for her life, some reason why her life was spared while so many others were lost. Autumn’s search for answers brings her closer to the families of the victims, especially Paul and Reese Elliott, who each play significant roles in the development of this story and the protagonist's desire for closure. When I began listening to this book, I was expecting a suspenseful novel and anticipated following along as the survivor, families of the victims, and members of law enforcement sought information, identified and apprehended a suspect or group of suspects, and brought those responsible to justice. Instead, I found an honest, poignant, portrayal of grief in the aftermath of tragedy and an exploration of the emotional and spiritual journey towards healing. Told from a variety of perspectives, including that of a survivor and those of a bereaved husband and daughter, this story demonstrates the far-reaching physical and psychological impacts of trauma and emphasizes the wide spectrum of emotions associated with loss, encompassing episodes of denial, anger, sadness, and acceptance. Generally I'm not a fan of dual narration, but i am a fan of Stacey Glemboski, and the blurb for this book pulled me in, so I gave it a go. I am so glad I did, everything about this book was excellent! The narration was beautifully done, Stacey and Joe worked really well together and the result is a narration that is seamless to listen to. They did a great job of matching up the character voices enough so that it was easy to tell who easy speaking. I actually forgot that I was listening to two different narrators and yet had all the benefits of listening to two very talented voice artists. The story was just as good, it took barely any time for the story to capture my attention and my emotions. I'm a bit lost for words and I'm having a tough time figuring out how to convey just how much I loved this book. The writing is beautifully done and the story somehow manages to be both simple and complex. The leading characters are very compelling and I couldn't help but want everything to work out for them. Highly emotive, this is a book that will capture your heart and refuse to let go. Good wholesome story about finding hope after darkness strikes tragedy in many lives. Nice narration, believable characters. Where does Life After rank among all the audiobooks you’ve listened to so far? It’s near the top. I think this story works really well on audio. It passes the “driveway test” (I wanted to sit in my car and keep listening after I got home.) I enjoyed the alternating male and female narration. What other book might you compare Life After to and why? I don’t think I have read anything quite like this book. Which character – as performed by Joe Hempel and Stacey Glemboski – was your favorite? Autumn Manning. I thought her obsessive tendencies and her sometimes paralyzing anxiety were very realistic for someone who had just experienced a tragedy of such magnitude. She seemed very authentic and relatable. This was my first book by Katie Ganshert, and I am certain I will be coming back for more. I think this book works very well on audio as the plot keeps the story moving along, and the alternating narrators help the listener to keep everything straight. This book grabbed my interest from the first page! It was my first audio book, and the second book by Katie Ganshert. I loved how the narrators brought the characters to life for me- how their voices changed with the characters. The story line was very real, I found myself laughing and crying at times. I was surprised at the twists it took! I kept thinking about this book long after it ended. How God does truly have a plan for each of us!! I won the audio code for this book. The opinions are my own. Unique story that caught me on the first page! Loved this unique story by Katie Ganshert! The plot and characters kept me listening to find out how everything would turn out. I loved that through it all, the message was God has a plan and he makes no mistakes. As for the audible part of the book, the narrators did an amazing job of telling the story! They truly made the story come to life as I listened. This was an interesting story and I liked how there were different narrators for different characters. What did you love best about Life After? I loved this book! Katie Ganshert is a terrific author that always produces an easy read/listen :). Looking forward to more audible books by her! I love the developmental of all the characters and how their paths crossed and intermingled to connect in the end. Oh my! This book was just as good the second time around as the first time I read it. The first time around I read it and then I won this promo code for this audio and listened to it. The narrators were perfect! You could hear and feel the emotions in their voices. The rest of the review is from when I read the book. A bomb shatters a train and kills its passengers, that is all but one. The aftermath is not pretty. Only one survivor and it totally changes her life. Autumn can't live her life for following the survivors next of kin and the deceased people and their families haunt her. She wonders why she lived and they were all killed. She feels so guilty that she can hardly go on with life. She gets really close to one family that the wife and mother of the family died. But will she bring more heartache to them or can she help them? This book was different than what I usually read, because I like Historical Fiction, but I like different sometimes too just to get out of the rut so to speak and I'm certainly glad I read this story. I got close to the characters and felt their pain, because like most people I have had tragedy in my family. You will feel the raw emotions of these families (especially the survivor Autumn and one of the victims's next of kin Paul and his children) as they try to heal. You will also feel the hope they have as they try to pick up the pieces of their lives. This is my first book of Katie Ganshert's but it certainly won't be the last because I have absolutely enjoyed every word. It touched me and made me think. I didn't want to quit reading this book because it was wonderful right from the first page. I recommend this book to my friends and anyone that needs the hope that eventually (with God's help) you will overcome the tragedies in your life. I'm gladly giving five stars to this book and would give more if possible. I won an audio promo code from the author and was not required to write a review. All opinions are my own. What a fantastic story! This book works through so many difficult topics and handles them with grace and dignity. Katie's writing is truly engaging and heart - wrenching. I loved every second of this audio book...from the narration to the redemption to the sweet romance!